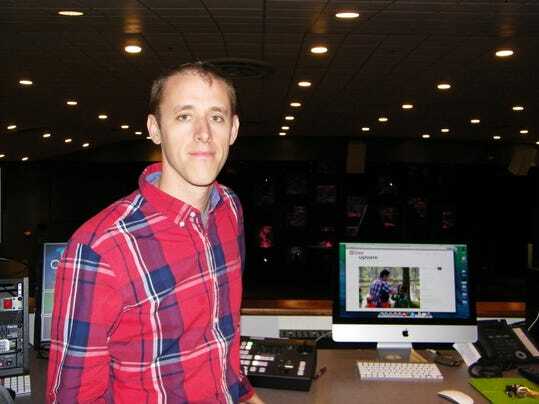 Monday’s Fremont, Ohio, Times-Messenger, includes an interview with Jeremy Framstad, who serves as director of technology arts at Grace Community Church, a Grace Brethren congregation in Fremont (Kevin Pinkerton, pastor). A portion of the story appears below. Click here to read the complete article. FREMONT – Each Sunday morning, Christians attending Grace Community Church in Fremont hear a sermon that is enhanced by technology. The lights, music and video that enrich the service are kept in order by Jeremy Framstad — the director of technology arts — and his crew of paid and volunteer workers. Framstad recently took his talents to Thailand to document a mission trip to a church-supported orphanage. But on an average Sunday, Framstad can be seen monitoring the service’s technology from a sound box at the back of the sanctuary. The technology is not meant to entertain, but rather to meet people where they are in an effort to bring them closer to God.